As glass condominium towers continue to push their way into city skylines like sunflowers squeezing up through walled gardens, some homeowners and developers have come to a realization: Floor-to-ceiling glass may provide breathtaking views, but it cuts down on opportunities for displaying art. And because art collectors represent a significant portion of the small pool of people who can afford homes in such buildings, that can be a problem. To cater to wealthy people amassing Warhols and Murakamis, a number of developers are designing condo towers specifically with art display in mind. At 100 East 53rd Street in Midtown Manhattan, for instance, where apartments start at $2.45 million and run past $9 million, the development company RFR commissioned the architecture firm Foster & Partners to design some units with the vibe, and wall space, of a downtown gallery. On a recent tour of the loft-style units, Mr. Steinberg, whose company is handling sales and marketing for the building, pointed to the uninterrupted expanses of concrete walls and also to the polished concrete floors. “It’s the kind that you may see when you go to a Gagosian Gallery or Paul Kasmin gallery,” he said. The ceilings are finished with fluted concrete panels separated by slots that allow lighting to be installed and arranged to illuminate particular works. The exterior glass filters ultraviolet rays to help protect precious pieces. “These spaces have contemporary high-rise benefits, but all the attributes of a downtown loft — without the creaking floors and subway rumble,” Mr. Steinberg said. 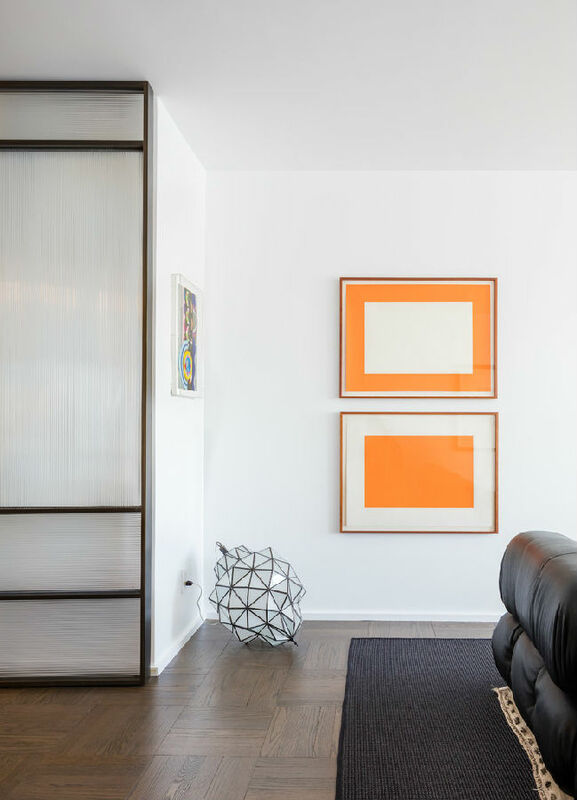 To hammer that point home, one of the model units is staged as a gallery rather than a home, with a trove of contemporary works from Mr. Rosen’s collections, including large-scale canvases by Damien Hirst, Andy Warhol and Jonas Wood, and sculptures by John Chamberlain, Urs Fischer and Jorge Pardo. The building’s focus on art extends to the lobby, too, where residents are greeted by a site-specific work by Rachel Feinstein that depicts New York City icons, including the Empire State Building and the Metropolitan Museum of Art, commissioned specifically for the building. This art-friendly attitude has attracted buyers like Ingrid Cincala Gilbert, principal of the art consulting firm Cincala Art, who bought one of the building’s more conventional units, with white-oak floors and drywall. “The vision that Aby Rosen had for making art an important character in the story of the building was really compelling to me,” Ms. Cincala Gilbert said, noting that many of her clients had art display in mind when buying real estate. That may help explain why floor plans for apartments at 160 Leroy Street, which the developer Ian Schrager conceived with the architecture firm Herzog & de Meuron, and which are priced from $4.5 million to $50 million, are labeled with room types and also with wall locations where works might be displayed. At 180 East 88th Street, where apartments start at $1.295 million and run past $6 million, the development company DDG is building a 50-story masonry skyscraper with punched windows, which leaves more wall space for art than a building with a glass curtain wall. Units are equipped with picture rails that allow buyers to install art on chains. David Mann, the founder of MR Architecture & Décor, said that creating places to display art was also a priority when his firm designed the condos in a new glass tower at 111 Murray Street, where units are priced from $2.5 million to $40 million. Rather than buy a preconfigured apartment to show off an art collection, many collectors go the custom route and work one-on-one with an architect or interior designer to address their specific needs. For one collector in Midtown Manhattan, Mr. Mann’s firm recently renovated an apartment where plump sofas by Mario Bellini now float in the middle of the living room. The liberated wall space is devoted to works by Bruce Nauman, Deborah Kass and Donald Judd. In the study, low, wall-mounted bookcases also free up display area. For one such collector, Mr. Mann designed a wall with ideal proportions to display a Minimalist masterwork by a renowned artist (he declined to disclose the artist’s name to protect his client’s privacy). Mr. Mann added recessed lighting in the ceiling above, arranged the furniture to funnel views toward the artwork and spent days experimenting with wall paint to find the most complementary shade of white.